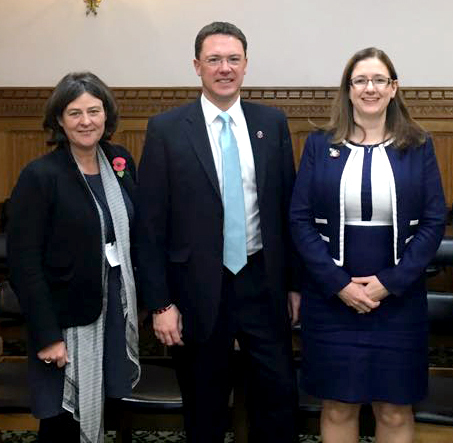 NRCN Chair Julia Mulligan (left) with APPG member and MP for Witney, Robert Courts, and APPG Chair and MP for Sleaford and North Hykeham Dr Caroline Johnson. NRCN Chair and North Yorkshire Police and Crime Commissioner Julia Mulligan met with the All Party Parliamentary Group (APPG) on Rural Crime at the invitation of Dr Caroline Johnson, MP for Sleaford and North Hykeham and Chair of the APPG on Tuesday (30 October). The meeting discussed the important issues raised by the survey of over 20,000 people and the need for the recommendations to be taken up as soon as possible by government and other agencies, including the police and Environment Agency. “Following the survey, we now need to see action to ensure our recommendations are put into place to reduce crime, and the fear of crime, for rural residents, families and businesses. “I am grateful to Julia for taking the time to come to present the survey’s findings to the APPG.